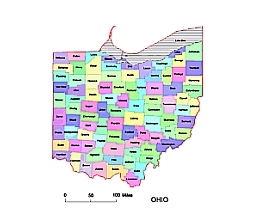 Editable royalty-free map of Ohio, OH in vector-graphic online store. 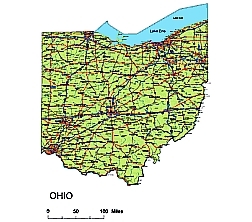 Ohio is located in the midwestern state portion of the United States (a Great Lakes State), and it is bordered to the north by Michigan and Lake Erie, to the northeast by Pennsylvania, to the southeast by West Virginia, to the south by Kentucky, and to the west by Indiana. 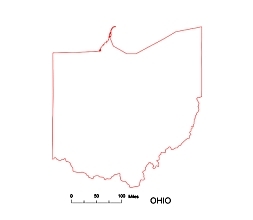 Preview of Ohio State vector road map. 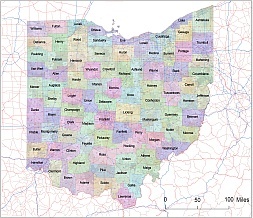 Ohio’s topography consists of three easily identifiable regions with a general northeast to southwest trend: the Great Lakes Plains, the Central Plains, and he Allegheny Plateau. 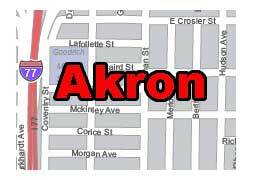 There are also two smaller notable physiographic zones. 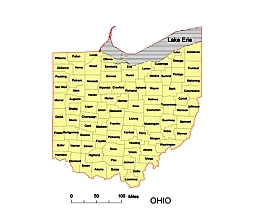 One is a small strip in the north bordering the Lake Erie shoreline called the Lake Erie Plains. 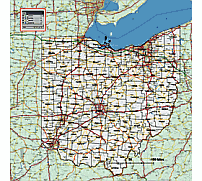 This region, which varies in width from 50 mi (81 km) at Toledo’s Maumee Bay to 10 mi (16 km) at Conneaut near the Pennsylvania border, extends for all 312 mi (503 km) of the Ohio portion of the Lake Erie shoreline. The shoreline itself also has two very different geographies.